Sneak Previews at FOF Booth #1120. For Horror & Fantasy Fans, Fan Expo Canada is Halloween, Dia de los Muertos and Christmas all rolled together under a single, huge roof. And, once again, Crypt Club Productions Inc. will have a booth (#1120 to be exact) within the show as part of the Rue Morgue Festival of Fear. Swing or lurch on by the Crypt Club Productions Inc. booth (#1120) and say "Boo!". We'll be showing off our exclusive Crypt Wear, "AAAAAH!! Indie Horror Hits, Volume 1" and screening some sneak peaks of the soon to be released "AAAAAH!! Indie Horror Hits, Volume 2". If volume 1 was All Killer - No Filler, then volume 2 is More Killer - Still No Filler. “... some of the best short films I have seen in a while. “...consider adding this to your horror film collection. Indie filmmakers are encouraged to drop off DVDs and a completed submission form(download them here) for future volumes of "AAAAAH!! Indie Horror Hits". We look forward to screening your works. Canada's uber-fantasy convention runs from Friday August 28 until Sunday August 28 at the Metro Toronto Convention Centre. Tons of special guests will be present from the horror, comics, anime, and sci-fi worlds. Screenings, celebrity & artist interviews, autographs, costume contests, parties, and a huge retailer section are on the bill to make this weekend the fantasy highlight of the summer. Dancap Productions Inc. is pleased to announce the Canadian Premiere of THE TOXIC AVENGER, an eco-monster musical comedy based on the 1984 Lloyd Kaufman classic cult film. The Canadian production will take place at The Music Hall (998 seats) on Danforth Avenue, currently undergoing renovations to accommodate the show. Toxie, is a seven-foot mutant freak with superhuman strength and a heart as big as Newark. He’s out to save New Jersey, end global warming and woo the prettiest, blindest librarian in town, in a toxic love story with an environmental twist. THE TOXIC AVENGER features an on-stage rock band and such memorable songs as Thank God She’s Blind, You Tore My Heart Out, Big Green Freak, Hot Toxic Love and My Big French Boyfriend. 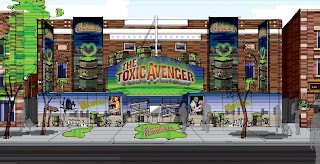 THE TOXIC AVENGER, winner of the 2009 Outer Critics Circle Award for Best New Off-Broadway Musical, continues at New World Stages in New York where the show celebrated its 100th performance on July 3. THE TOXIC AVENGER features music and lyrics by David Bryan (Memphis, keyboardist and founding member of Bon Jovi), and book and lyrics by Joe DiPietro (I Love You, You’re Perfect, Now Change; Memphis, All Shook Up; Over the River and Through the Woods). The Dancap Production will feature a Canadian cast and band, and will be directed by Tony Award-winner John Rando (Urinetown, The Wedding Singer).